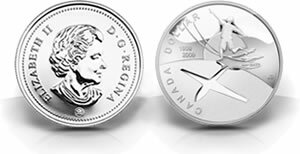 The newest 2009 silver dollar coins from the Royal Canadian Mint celebrate the centennial of Canada’s first flight and its historic leadership in aviation. 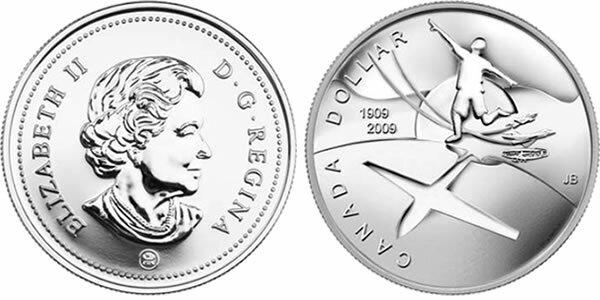 A proof and a brilliant uncirculated silver coin commemorate Canada’s achieved aviation advances throughout the years, and the beginning of Canadian flight 100 hundred years ago — the Silver Dart airplane completed its 0.8 km (0.5 mi) maiden flight over a frozen lake in Nova Scotia on February 23, 1909. Designed by Ontario artist Jason Bouwman, this sterling silver dollar features an image of a young person running with arms spread like an airplane’s wings, symbolizing humanity’s timeless dream of flight. Both silver dollars are minted using 92.5 percent silver and 7.5 percent copper. Each ways 25.18 grams, has a diameter of 36.07 millimeters, and feature a serrated edge. Each has a limited mintage of 50,000.